Whether you work full time or stay at home with your child, part of parenting is just being busy or downright exhausted. All the time. As a new mom, I barely managed to wash my hair regularly, much less found time for something optional like working out -- and I know that I'm not alone. So many moms and dads that I know have let fitness fall to the wayside so they can focus on their kids, or because they are too tired to even think about working out -- and I totally identify with these feelings. But one thing I've learned in my first year of mommyhood is that exercising regularly helps you be a better parent. What's good for you is good for your kids, and staying fit gives you the energy to chase after your toddler or play with your older kids. There's also some solid research linking regular exercise to happiness, and I think we're all better parents when we're happy, right? The trouble is finding the time to exercise -- especially when your little ones are always underfoot. The tips and ideas below are ones that have worked well for me or for other parents that I know. I hope you'll share your own tips in the comments for sneaking in exercise as a busy parent! Don’t think of your kid as a barrier to getting regular exercise. Scoop that baby up, and use him in your workouts! My son loves when I hold him while I do some common strength training like squats, lunges, calf raises, and even overhead presses. If you were doing these exercises with weights before, just use your baby as the weights. Whether you’re new to these moves or an old pro, remember that holding a baby is not quite the same as holding free weights. 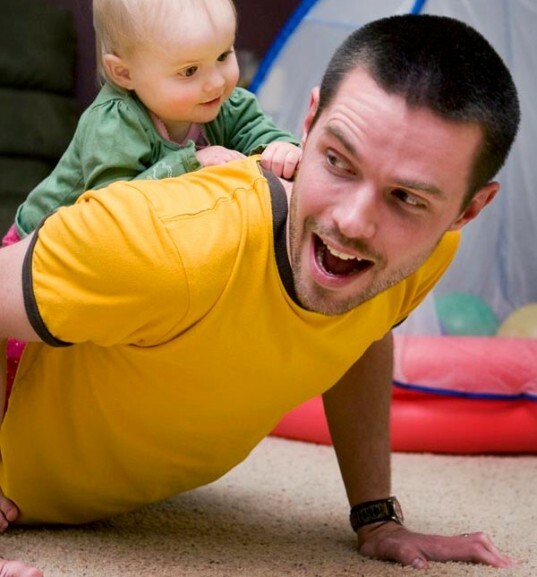 Babies wiggle, and your toddler might be heavier than weights you’d select at the gym. When you’re holding your baby during exercise moves, caution is key, of course. Unlike with free weights, you don’t want to push yourself to exhaustion, because dropping your toddler is not an option! You’re still getting the benefit of exercise, even if you don’t push yourself as far as you did before you were a parent. Some exercise is better than none! You can also incorporate your kids into your yoga routine. My son thinks that certain yoga poses – like downward facing dog – are hilarious! He crawls around me, touching my face and laughing while I hang out upside down for a few glorious minutes. I get the benefits of sneaking in some yoga time, and he gets to play with mommy while I do it. With older kids, you can even get them in on the yoga goodness! Let them help you choose a yoga DVD, and you guys can practice together. Obviously, this is going to be different from the focused, 60-90 minute yoga routine you may have practiced before having kids, but don’t think of it as inferior. It’s just different. By involving your baby in your practice, you get to play and bond with your child while doing something good for yourself. A win for both of you! Does the idea of working out with your kid kind of overwhelm you? There are companies that specialize in parent and child fitness! Some of the moms I know here in Atlanta take their kids to Oh Baby Fitness, where they offer mom and baby yoga as well as strength and cardio classes that you can attend with your baby. Try googling “mom and baby yoga” or “mom and baby exercise class” plus the name of your town and see what you can find. Don’t worry – dads can go to these classes too! One of the things that keeps me from checking out classes like this is my budget. If money is tight for you, you can try dropping in on a single class rather than signing up for a whole series of classes. Most places will let you try one class for free or a small fee. While you’re there, pay close attention so that you can practice the moves you learn at home for free. 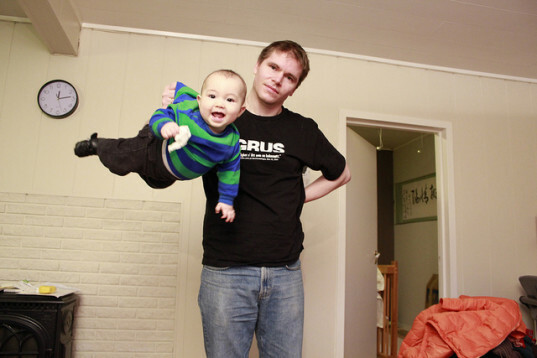 Strap that baby into a wrap or carrier or into his stroller, and hit the pavement! Walking is so beneficial to our health, and it’s something that you can do with your child from day one. I find it hard to get out the door for a walk sometimes, and one thing that has helped me a lot is finding walking buddies. My buddies are usually other work-at-home parents, because we have compatible schedules. If you’re more of a runner, get that kid into a jogging stroller when he’s big enough! Generally, you want your child to have good head control before putting him into a jogging stroller. I was an avid runner before having my baby and I’m still deciding whether to invest in a jogging stroller. I’ve done quite a bit of research on jogging strollers, though, and the Bob strollers seem to get the best ratings. 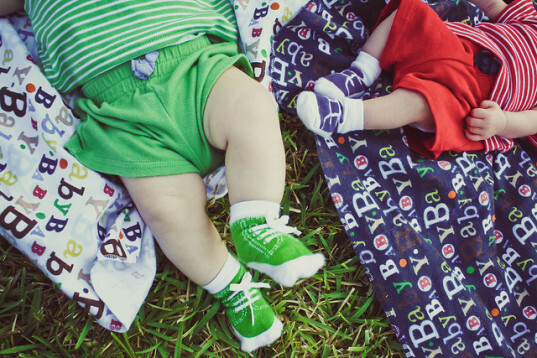 They have a handy page on their site where you can select a stroller based on your needs: walking, jogging, even hiking! You can also find amazing deals on jogging strollers at baby consignment stores and on Craigslist. 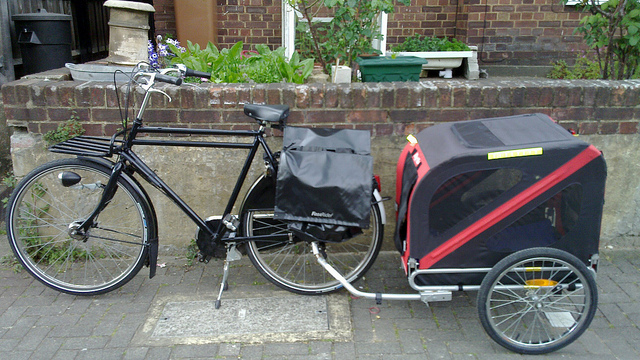 Was cycling more your speed before having a baby? Bring him along! You can find child seats that attach right onto your bike frame or go for a bike trailer for your little one. Just like with jogging strollers, you want your kiddo to have good head control before taking him on a bike ride with you. All of that jostling is unsafe for tiny babies. My advice would be to get the OK from your pediatrician, if you’re not sure whether your little one is ready for a bike ride. If you’re strapping your kiddo into a bike seat rather than a trailer, you also want to shop for a baby bike helmet to protect his little head in case you guys take a spill. RELATED | The Great Bike Seat Debate: Which One is Right for You? Don't think of your kid as a barrier to getting regular exercise. Scoop that baby up, and use him in your workouts! My son loves when I hold him while I do some common strength training like squats, lunges, calf raises, and even overhead presses. If you were doing these exercises with weights before, just use your baby as the weights. Whether you're new to these moves or an old pro, remember that holding a baby is not quite the same as holding free weights. Babies wiggle, and your toddler might be heavier than weights you'd select at the gym. When you're holding your baby during exercise moves, caution is key, of course. Unlike with free weights, you don't want to push yourself to exhaustion, because dropping your toddler is not an option! You're still getting the benefit of exercise, even if you don't push yourself as far as you did before you were a parent. Some exercise is better than none! You can also incorporate your kids into your yoga routine. My son thinks that certain yoga poses - like downward facing dog - are hilarious! He crawls around me, touching my face and laughing while I hang out upside down for a few glorious minutes. I get the benefits of sneaking in some yoga time, and he gets to play with mommy while I do it. With older kids, you can even get them in on the yoga goodness! Let them help you choose a yoga DVD, and you guys can practice together. Obviously, this is going to be different from the focused, 60-90 minute yoga routine you may have practiced before having kids, but don't think of it as inferior. It's just different. By involving your baby in your practice, you get to play and bond with your child while doing something good for yourself. A win for both of you! Does the idea of working out with your kid kind of overwhelm you? There are companies that specialize in parent and child fitness! Some of the moms I know here in Atlanta take their kids to Oh Baby Fitness, where they offer mom and baby yoga as well as strength and cardio classes that you can attend with your baby. Try googling "mom and baby yoga" or "mom and baby exercise class" plus the name of your town and see what you can find. Don't worry - dads can go to these classes too! One of the things that keeps me from checking out classes like this is my budget. If money is tight for you, you can try dropping in on a single class rather than signing up for a whole series of classes. Most places will let you try one class for free or a small fee. While you're there, pay close attention so that you can practice the moves you learn at home for free. Walking is so beneficial to our health, and it's something that you can do with your child from day one. I find it hard to get out the door for a walk sometimes, and one thing that has helped me a lot is finding walking buddies. My buddies are usually other work-at-home parents, because we have compatible schedules. If you're more of a runner, get that kid into a jogging stroller when he's big enough! Generally, you want your child to have good head control before putting him into a jogging stroller. 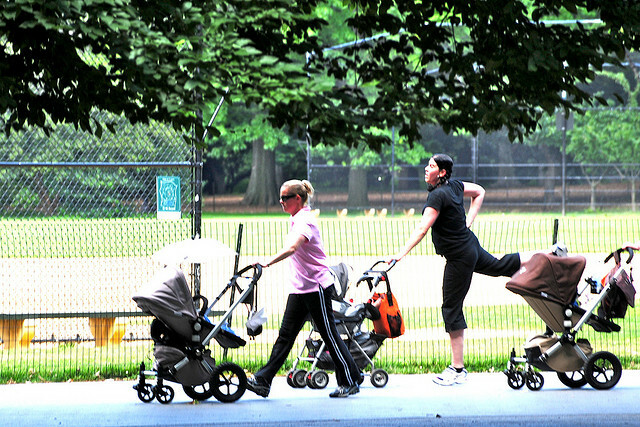 I was an avid runner before having my baby and I'm still deciding whether to invest in a jogging stroller. I've done quite a bit of research on jogging strollers, though, and the Bob strollers seem to get the best ratings. They have a handy page on their site where you can select a stroller based on your needs: walking, jogging, even hiking! You can also find amazing deals on jogging strollers at baby consignment stores and on Craigslist. Was cycling more your speed before having a baby? Bring him along! You can find child seats that attach right onto your bike frame or go for a bike trailer for your little one. Just like with jogging strollers, you want your kiddo to have good head control before taking him on a bike ride with you. All of that jostling is unsafe for tiny babies. My advice would be to get the OK from your pediatrician, if you're not sure whether your little one is ready for a bike ride. If you're strapping your kiddo into a bike seat rather than a trailer, you also want to shop for a baby bike helmet to protect his little head in case you guys take a spill.